In the month of Kislev in the twentieth year, while I was in the citadel of Susa, 2Hanani, one of my brothers, came from Judah with some other men, and I questioned them about the Jewish remnant that survived the exile, and also about Jerusalem. 3They said to me, "Those who survived the exile and are back in the province are in great trouble and disgrace. The wall of Jerusalem is broken down, and its gates have been burned with fire." "O LORD, God of heaven, the great and awesome God, who keeps his covenant of love with those who love him and obey his commands, 6let your ear be attentive and your eyes open to hear the prayer your servant is praying before you day and night for your servants, the people of Israel. I confess the sins we Israelites, including myself and my father's house, have committed against you. 7We have acted very wickedly toward you. We have not obeyed the commands, decrees and laws you gave your servant Moses. 10"They are your servants and your people, whom you redeemed by your great strength and your mighty hand. 11O Lord, let your ear be attentive to the prayer of this your servant and to the prayer of your servants who delight in revering your name. Give your servant success today by granting him favor in the presence of this man." 2:1In the month of Nisan in the twentieth year of King Artaxerxes, when wine was brought for him, I took the wine and gave it to the king. I had not been sad in his presence before; 2so the king asked me, "Why does your face look so sad when you are not ill? This can be nothing but sadness of heart." I was very much afraid, 3but I said to the king, "May the king live forever! Why should my face not look sad when the city where my fathers are buried lies in ruins, and its gates have been destroyed by fire?" 4The king said to me, "What is it you want?" Then I prayed to the God of heaven, 5and I answered the king, "If it pleases the king and if your servant has found favor in his sight, let him send me to the city in Judah where my fathers are buried so that I can rebuild it." 6Then the king, with the queen sitting beside him, asked me, "How long will your journey take, and when will you get back?" It pleased the king to send me; so I set a time. 7I also said to him, "If it pleases the king, may I have letters to the governors of Trans-Euphrates, so that they will provide me safe-conduct until I arrive in Judah? 8And may I have a letter to Asaph, keeper of the king's forest, so he will give me timber to make beams for the gates of the citadel by the temple and for the city wall and for the residence I will occupy?" And because the gracious hand of my God was upon me, the king granted my requests. 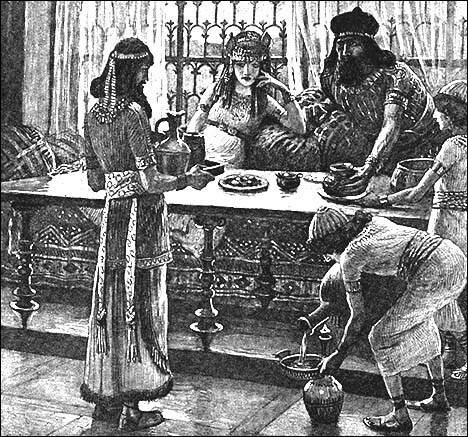 9So I went to the governors of Trans-Euphrates and gave them the king's letters. The king had also sent army officers and cavalry with me. But then the work of restoration seems to stall once more. In the time of Nebuchadnezzar, the gates of Jerusalem had been destroyed. Whole sections of the wall around the city had been pulled down and destroyed. The city had been devastated. When the Jews returned, they had attempted to restore its defenses, but had been prevented from doing so. A few years before we meet Nehemiah, Ezra the Priest had come to Jerusalem in 458 BC, with royal backing from Artaxerxes I (464-423), the Persian king, to restore worship and bring reforms (Ezra 7). Under his leadership the Jews had begun to restore the walls of the city and repair their foundations (Ezra 4:12). The archives were examined, Jerusalem's history of rebellion against the Babylonian kings was found, and, in the absence of a person to plead the case of the Jewish people, the king had replied: "Now issue an order to these men to stop work, so that this city will not be rebuilt until I so order" (Ezra 4:21). Jerusalem's enemies, now with royal backing, "went immediately to the Jews in Jerusalem and compelled them by force to stop" (Ezra 4:23).1A local Samaritan army had crushed the Jews in the name of the king, forcing them to stop construction. This is the sad situation that exists when the Book of Nehemiah opens. The Jews have recently lost their royal backing and their enemies are free to continue their oppression, intimidation, and dominance in Jerusalem. 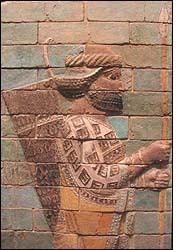 Glazed bricks of soldier from Susa, now in the Lourve, Paris. The book begins by introducing Nehemiah, whose name means "consolation of Yahweh." The date appears to be mid-November to mid-December 446 BC. The place is "the citadel of Susa" (1:1), winter capital and palace of the Persian kings, home previously to both Daniel and Esther -- 700 miles and five or six months journey from Jerusalem. Susa is one of the oldest cities in the world, going back to 5000 BC. The suffering of his countrymen in Jerusalem is his suffering. Their shame is his shame. Their exposure to danger touches a chord deep within him. Let's examine his prayer. 6alet your ear be attentive and your eyes open to hear the prayer your servant is praying before you day and night for your servants, the people of Israel. 6bI confess the sins we Israelites, including myself and my father's house, have committed against you. 7We have acted very wickedly toward you. We have not obeyed the commands, decrees and laws you gave your servant Moses. 5we have sinned and done wrong. We have been wicked and have rebelled; we have turned away from your commands and laws. Nehemiah begins to pray10to the LORD (that is, God's revealed name, "Yahweh"), whom he describes as "the God of heaven," a phrase commonly used in the Persian empire. Like the Lord's Prayer, Nehemiah's salutation lifts his eyes to view the expansiveness of the Maker of the heavens. The phrase, "great and awesome God" is striking. As mentioned in our study of Daniel 9:4, "awesome" (NIV, NRSV) or "terrible" (KJV) is yārē, "be afraid, revere," which can refer to the emotion of fear as well as to "reverence or awe. "11We don't like the idea of a terrible or dreadful God. We would rather think of God as our buddy or "home boy." No! God is awesome. He has immense power under his sole control. Notice that this is not a single prayer, but "the prayer your servant is praying before you day and night for your servants, the people of Israel" (1:6a). This prayer is only the latest in a series of supplications that, we will see, has lasted four months. Q1. (1:1-6) Why does Nehemiah pray day and night for four months? Why does he fast and weep? Isn't that excessive? We examined this aspect of prayer at length in Daniel's confession. The second verb is "to gather," qābats. It is used of gathering food and of money, but most commonly of gathering people for social reasons, as an army, and for religious functions. The word is used many times for the gathering of God's people from their exile in Babylon (Ezra 1:1-4; Psalm 147:2; Jeremiah 32:37; Ezekiel 34:12-13; 36:24; Zechariah 8:7-8).15In the New Testament, ultimately, "gathering" refers to the gathering of the saints in the rapture (Matthew 3:12; 13:30; 24:31; 2 Thessalonians 2:1). Now Nehemiah quotes back to God his own words and promises. He doesn't seem to have a single passage in mind, but draws his thoughts from several passages, particularly Deuteronomy 30:1-3. They have consequently been restored "to the place I have chosen as a dwelling for my Name" (1:9). But Jerusalem's walls and gates are in ruins. The people are being oppressed in God's own city. You have a stake in the future of Jerusalem, Nehemiah contends, because it is the place where your Name dwells. When Jerusalem and God's people are in disgrace, it reflects on God's Name. Q2. (1:7-11) What is the basis of Nehemiah's appeal? How does he argue his case before God? What do we learn from this about intercession? "Let your ear be attentive to the prayer of this your servant and to the prayer of your servants who delight in revering your name." Give your servant success today by granting him favor in the presence of this man.' I was cupbearer to the king." Listen to our petition, oh God, for Jerusalem and give me favor before the king. This second petition was no "slam-dunk." Artaxerxes' policy on Jerusalem had flip-flopped and there was no way to assess his current attitude toward Jerusalem. In 458 BC Artaxerxes had ruled positively in favor of Ezra and given considerable money for the restoration of the temple and its sacrifices (Ezra 7:11-26). But recently, Artaxerxes' policy had turned against the Jews and Jerusalem, due to the court influence of their enemies (Ezra 4:17-23). What Nehemiah is asking God is to give Nehemiah so much favor that the king will be willing to reverse himself yet again. That might be embarrassing for the king and make him look weak and inconsistent. Nehemiah was a trusted servant, granted, but he seems to be more of a personal servant in the role of cupbearer than a secretary of state. When he makes his request of the king, if the king is angry or offended, Nehemiah could quite easily lose his job or even his life! No king wants to feel manipulated, particularly by his servants who might presume upon their position to ask for personal favors. "'Do not think that because you are in the king's house you alone of all the Jews will escape. For if you remain silent at this time, relief and deliverance for the Jews will arise from another place, but you and your father's family will perish. And who knows but that you have come to royal position for such a time as this?'" Q3. (1:11) In what way does Daniel's situation compared to Esther's? Why does God place his people in strategic positions today in the community, in business, in the military, in government? What responsibilities do we have to God that can cause danger to our positions and our lives? Has this ever happened to you? How do you pray in situations like this? "Favor" (NIV) and "mercy" (KJV, NRSV) is raḥăm�m, "tender mercy, compassion." The word can refer to the seat of one's emotions or the expression of one's deep emotion.17Nehemiah is praying that some kind of bond of empathy or compassion will be formed between the king and him. Nehemiah has humbled himself before God in weeping, mourning, and fasting. He has prayed. Now four months after Nehemiah's initial receipt of the news about Jerusalem, the day has arrived. Nehemiah knows it. Wow! Instead of apologizing for his sadness and covering up its causes as we so often do, he is open. James J. Tissot (1836-1902, French artist and illustrator), "Cupbearer of the King"
This is the crucial moment. The king can dismiss him from service and banish him forever from his presence. You must admit, his openness can be construed to put some blame on the king for Jerusalem's dire situation. In fact, it resulted directly from the king's own policy. The king asks what he wants, and -- before he answers -- Nehemiah prays an quick and silent prayer (sometimes called an "arrow prayer") to God for help. Then he answers the king. It is important to observe, however, that Nehemiah's "arrow prayer" was not the extent of his prayer life, but rather the overflow. Nehemiah has agonized in prayer over this issue for days and months. The "arrow prayer" is but a continuation of Nehemiah's conversation and partnership with God about this issue. Pālal, the common verb for prayer is used both here and 1:4. The difference is quantitative, not qualitative. Q4. (2:4) What danger is Nehemiah in? Why does he pray quickly and silently before he answers the king? How does this quick "arrow prayer" relate to the four months of prayer he has just finished? In the king's response Nehemiah can sense that God has indeed given him favor. The king's concern is not whether he should go and rebuild Jerusalem, but how long he'll be gone. At the crucial moment, Nehemiah is afraid, but through faith in the God of heaven he overcomes his fears, states the need and makes his request of the king. We aren't responsible for the result, only for our part. It is up to God to answer our prayer, if we have prayed well and according to God's own will and purposes. In this case, Nehemiah reports: "And because the gracious hand of my God was upon me, the king granted my requests" (2:8). What Do We Learn from Nehemiah's Prayer? Nehemiah prayed for four months until it was time to bring the matter to the king. We must be patient in prayer and sensitive to the Lord's leading. In the absence of definitive information in the Scripture, there is some dispute about when the walls were destroyed and how much was rebuilt by the early Jewish returnees. I have followed F. Charles Fensham, The Books of Ezra and Nehemiah (New International Commentary on the Old Testament; Eerdmans, 1982), p. 152; and Derek Kidner, Ezra and Nehemiah: An Introduction and Commentary (Tyndale Old Testament Commentaries; InterVarsity Press, 1979), p. 78. 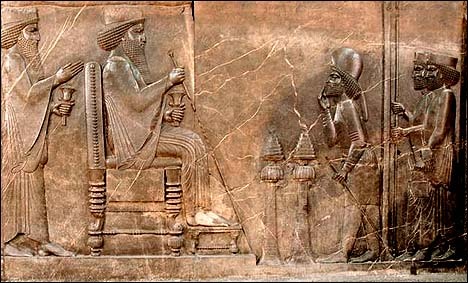 "Cupbearer" is mashqeh, "cup bearer, irrigation, drink." Used to describe the chief cup-bearer of a king, a position of trust and responsibility, also in Genesis 40 (Hermann J. Austel, shāqā, TWOT #2452c). The word āḥ can mean, "brother, relative, fellow countryman, friend," so it is difficult to be certain of the relationship (Herbert Wolf, �ḥh, TWOT #62a). "Trouble" (NIV, NRSV) and "affliction" (KJV) is rā�ā, "evil, misery, distress" (G. Herbert Livingston, TWOT #2191c). "Disgrace" (NIV), "reproach" (KJV), and "shame" (NRSV) are ḥerpâ, "taunt of enemy, reproach cast upon another, scorn, contumely" (BDB 358; Thomas E. McComiskey, ḥārap, TWOT #749a). John N. Oswalt, bākā, TWOT #243. Biblical mourning for the dead involved emotion, usually expressed audibly (Jeremiah 22:18; Jeremiah 48:36) and visibly (Genesis 37:34; Psalm 35:14; Micah 1:8; J. Barton Payne, �ābal, TWOT #6). Ṣûm, "fast." Fasting is depriving the body of nourishment as a sign that one is experiencing great sorrow. Mourning is further expressed in weeping and lamentation and in putting on sackcloth and ashes (Esther 4:3). He who fasts claims to afflict himself or his soul, i.e., his inner person" (John E. Hartley, ṣûm, TWOT #1890). Andrew Bowling, yārē�, TWOT #907. BDB 431d, "inspire reverence, godly fear, and awe, as an attribute of God. Deuteronomy 7:21; 10:17; Nehemiah 1:5; 4:8; 9:32; Daniel 9:4. John E. Hartley, tsālēah, TWOT #1917. Leonard J. Coppes, rāḥam, TWOT #2146.